In May 2003 we took a two week trip to the Southern Highlands of Vietnam, the stunning beaches of Phan Thiet and a few days in Cambodia. I hope this report will give you some idea what to expect when you travel to Vietnam or Cambodia with Dragon Travel. We planned to visit three places, the Central Highlands of Vietnam, the beaches of Phan Thiet in the South and finally a few days in Cambodia seeing the world famous Angkor Wat plus two days in the capital, Phnom Penh. Our 14 day tour itinerary was 2 days in Ho-Chi-Minh, 5 days in Buon Ma Thout and Pleiku, 3 days relaxing in Phan Thiet, 2 days in Siem Reap/Angkor Wat & 2 days in Phnom Penh. The combination of highlands, beaches, cities & the largest temple complex in the world would make a fabulous 2 week tour. We left Heathrow on the midday flight via Kuala Lumpur & arrived in Ho Chi Minh City in Vietnam the following morning at 10am. 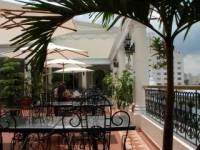 We checked into the 4* Majestic hotel by the Saigon river. This original French colonial style building reflects the elegance & feel of a bygone era. The beautiful swimming pool is in the inner courtyard and circled by all the lovely balconies of each room looking down. The Breeze Sky Bar is one of the most unique places in town with a panoramic view of the famous Saigon River. I drank from a large bottle of Saigon beer while watching the traffic sailing along the river. The occasional breeze brought extra pleasure. It cannot be a better start to see the former Saigon. 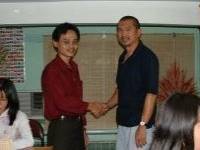 Our driver picked us up from the hotel & delivered us to my tour agents office for a meeting with the director Mr. Nguyen. That night Mr. Nguyen & his wife held a welcome dinner for us in a beautiful Vietnamese restaurant called Blue Ginger. The modern decor combines Vietnamese culture with elegant & comfortable environment. There is a beautiful courtyard for outdoor sitting during the day. The food was good, the Pan fried shrimp with scallion ravioli & hot sour prawn soup most memorable. We rose at 5:30 next morning in order to catch the flight to Buon Ma Thuot at 7am. We had to miss breakfast to get to the airport. As our car drove into the early hours of the HCM city traffic my resentment at this early departure changed into guilt. The normal traffic of motorbikes was nowhere to be seen, instead the roads were filled with people walking, jogging & exercising. The young, the old, men, women & even children were all happily working out in the dawn light. Memories of my father doing Tai Chi exercises in the park at dawn came flashing back to me. I began to feel as happy as the early risers on the roads. Vietnamese people rise with the sun. A 45 minute flight took us to the south central highlands of Buon Ma Thuot, a city of aromatic coffee. A local tour guide named Siu Cham met us at the airport. Cham is from a minority people himself, but the strange thing is that I share the same surname (Siu) with him although I spell it slightly differently. Cham has a good knowledge of the minority people & their culture and a good command of English as he also works as an English teacher in his local town, Pleiku as well as the tour guiding. We were in good hands for our stay in Buon Ma Thout. The tours started with a trip to see the stunning Dray Sap Falls. (Dray Sap means 'Smoky waterfall). A mist of invigorating spray fills the air from the rocks making this a very dramatic place to visit.